On the November 6, 2018, General Election Ballot, Nebraska voters will decide whether to approve or reject an initiative petition to expand Medicaid coverage under the federal Affordable Care Act (ACA). 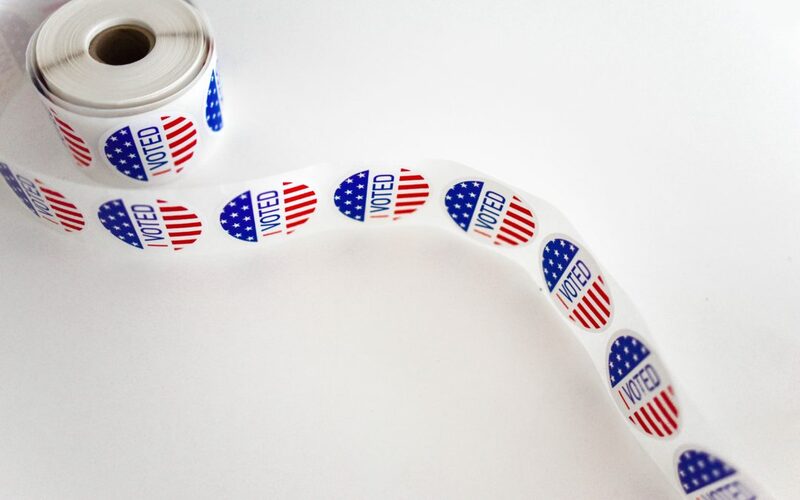 Reacting to the Nebraska Legislature’s refusal to expand Medicaid coverage under the ACA over the past six years, expansion proponents turned to the ballot initiative process that proposed an expansion law (not a constitutional amendment). Supporters began collecting signatures on March 31, 2018. The “Insure the Good Life” campaign submitted over 133,000 signatures to the Nebraska Secretary of State’s office on July 6, 2018. On August 24, 2018, the Secretary of State confirmed that the ballot petition measure, Initiative 427 (I-427) earned enough signatures to appear on the November 6, 2018, general election ballot. At least 84,269 valid signatures were required to add the petition question to the 2018 general election ballot, and 104,477 signatures were certified, a 74% acceptance rate. If passed, I-427 would qualify Medicaid coverage for Nebraskans making up to 138% of the poverty level, or $16,753 for a single person or about $28,676 for a family of three. A challenge to the petition drive was filed in Lancaster District Court by State Senator Lydia Brasch and former State Senator Mark Christensen alleging that a number of procedural, statutory and constitutional flaws, including that the petition contains more than one subject, which is not allowable under the Nebraska Constitution. Just days after the ballot measure was certified on August 28, 2018, the Lancaster County District Judge rejected those arguments. Brasch and Christensen filed an appeal of this decision to the Nebraska Supreme Court. The Nebraska Supreme Court dismissed the lawsuit and affirmed that the two issues (whether Nebraska should expand Medicaid and whether the state must ensure as much federal money as possible from the expansion) are naturally intertwined and constitute a single subject. However, the Nebraska Supreme Court left the door open to future challenges even if voters approve. The court said it is too early to decide if the initiative violates requirements for the Legislature to approve spending measures. If I-427 is approved by voters, Nebraska would join 33 other states and the Distinct of Columbia that have expanded Medicaid. Utah and Idaho will also have Medicaid expansion initiatives on November ballots. Last November, Maine voters approved expansion by initiative. Since Nebraska implemented Medicaid in July 1966, several waivers have been approved. The state’s eligibility guidelines are unchanged from 2013. Non-disabled adults without dependent children are ineligible for Medicaid, regardless of income. Children make up 59.5% of Nebraska’s Medicaid population. During the past few years, rising incomes in Nebraska caused the federal match rate to decrease from 53.27% to 51.16% in 2016. Due to this decline, the Nebraska Department of Health and Human Services requested an additional $76 million to cover the anticipated budget shortfall. By fiscal year 2017-2018, Nebraska’s federal match rate increased to 52.22%. The rate of Nebraskans without insurance dropped from 11.3% in 2013 to 8.3% in 2015. This decline is due to several provisions of the Affordable Care Act (ACA) including allowing adult children to remain on their parents’ insurance until age 26 and the Health Insurance Marketplace. 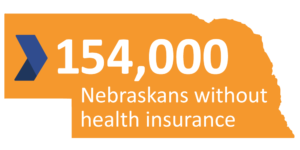 More than 87,000 Nebraskans purchased coverage through the Health Insurance Marketplace in the 2015-16 enrollment period. Nebraskans who earn less than 100% of the federal poverty level (or $20,160 for a family of three) do not qualify for federal tax credits through the Health Insurance Marketplace under the ACA. As originally written, these Nebraskans would have been covered by Medicaid. However, the U.S. Supreme Court decision National Federation of Independent Business v. Sebelius, made Medicaid expansion optional for states, creating the coverage gap that currently exists in Nebraska and 19 other states who have elected not to expand Medicaid. About 73% of Nebraskans in the gap are working according to data collected in 2015. Proponents point to a 2015 economic impact study conducted by economists at the University of Nebraska-Kearney that found Medicaid expansion would create new jobs, grow the economy, and decrease personal bankruptcies. Specifically, they found that each newly eligible Medicaid recipient would see an increase of $1,100 in discretionary income for a total of $88 million statewide. Economists know from other research, that individuals with lower household incomes are more likely to spend, rather than save, their discretionary income. This spending boost in local economies will generate 800 new jobs, $32 million in additional income, and $4.9 million in state and local tax revenue. Proponents also argue that rural critical access to hospitals will benefit greatly from Medicaid expansion since rural Nebraskans are more likely to be uninsured. Many of these hospitals are left to provide uncompensated health care, leaving them vulnerable to hospital closures. Opponents argue than an increased state share of Medicaid funding will result in reduced state funding for other programs, such as state aid to schools and political subdivisions, higher education, infastructure, income tax reform and property tax relief. Fiscal restraint, sustainability and uncertainty of future federal funding are major concerns. Opponents also maintain that medical care options will continue to diminish due to low reimbursement rates applied to an expanded Medicaid population. Finally, opponents believe that Medicaid expansion will create more pressure on lawmakers to look at additional revenue sources or increase sales or income taxes. If you have any questions about I-427 and how it might affect you, your clients, or the communities you serve, please do not hesitate to contact Tim Gay or Kaitlin Reece at Catalyst Public Affairs.